A general strike against rising living costs has been in progress on the French Caribbean island of Guadeloupe since Jan. 20. Forty-seven trade unions, associations and political parties under the umbrella organization LKP – The Committee against Extreme Exploitation (lyiannaj kont pwofitasyion in the local dialect) – have brought economic activity to a standstill. A massive demonstration of 25,000 out of a total population of 410,000 took place on Jan. 24 in the capital Pointe-à-Pitre. All shops, supermarkets, schools and public services were closed. On Jan. 30, 65,000 marched in Pointe-à-Pitre. On the neighboring French island of Martinique, 12 trade unions launched a general strike call Feb. 5 against the decrease in purchasing power, which has especially affected the 70,000 people on the island living below the poverty line. On Feb. 9, 25,000 marched there, in the capital Fort-de-France. Martinique’s population is 401,000. Although the fight against the increasing cost of living affects all of France’s citizens and Guadeloupe is officially part of the French Republic, the traditional labor organizations in metropolitan France have isolated and ignored the struggle and media coverage has been rare and superficial. 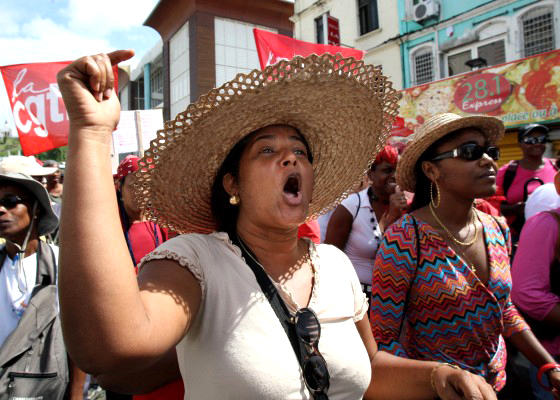 The demands of the strikers led by the majority trade union, the UGTG (General Union of Guadeloupean Workers), have centered on the price of basic necessities. They call for an immediate reduction of 50 centimes on car fuel, a lowering of prices of transport and water, a rent freeze, an increase of €200 (as part of France, the currency in Guadeloupe is the euro) in the minimum wage, permanent contracts for all temporary workers and the right to education and training for youth and workers. The development of local production to satisfy the population’s needs and an end to taxes on fertilizers and cattle feed also figure among the total of 146 demands advanced by the strikers. One demand calls for priority to be given to Guadeloupeans in key employment posts and an end to racism in employment. “All the people agree with our demands. Only Whites disagree,” writes a member of the International Committee of Black People in Guadeloupe to renowned scholar Runoko Rashidi. “Of course – because only they have the best jobs, and only they are boss. “When you are Black and you come to ask for work, with all your degrees, you cannot work in your country. You sacrifice to help your children excel in their studies but when they apply, they can’t work just because they are Black. THAT’S ENOUGH!” the writer declared. “Guadeloupe is now completely paralyzed,” reports the International Liaison Committee of Workers & Peoples (ILC). “There is no bus circulation; the port, utilities, schools, university, department stores and most businesses and shops are closed. The district of Baie-Mahault, the heart of the business district, is deserted. The port activity is virtually at a standstill. Guadeloupe, an archipelago 600 kms from Haiti and the Dominican Republic and 7,000 from mainland France, has been a colony since 1812. In spite of its integration into the French state in 1946, it has, like all other French possessions, remained economically backward. The effects of the world recession have been felt earlier in this already deprived island community. Guadeloupe constitutes a recognized region of France whose local council is run by the French Socialist Party (PS) and is the 97th French Department. According to 2007 figures, unemployment is well over 23 percent and prices for all basic necessities are 30 to 60 percent more expensive than in France. Only rum, bananas and cigarettes are relatively cheaper. Guadeloupe belongs to the group of the 13 poorest regions in Europe with a GDP of only 55.8 percent of the European average. Yves Jégo, President Nicolas Sarkozy’s secretary of state for overseas territories, was rushed to Guadeloupe the weekend of Jan. 31-Feb. 1 to calm things down and negotiate a way out before the social explosion links up with mainland France. Jégo announced several measures in an attempt to placate strikers and break the cohesion of the Guadeloupean strike. “We have succeeded after three days of negotiations in obtaining a clear commitment from supermarket chains to reduce 100 items of basic necessity by 30 percent in 60 supermarkets until the end of the year,” he said. A rent freeze was announced and the minimum social welfare payment (RSA) for those actively engaged in work will be implemented this year instead of next. The negotiations are ongoing and the reaction by the LKP strike committee is to maintain the strike. However, in an attempt to divide the movement, Jégo has succeeded in reopening the 115 service stations after promising the owners to limit any new installations affecting their profitability for three years. The reaction of all the strikers was summarized by this reflection of a bus driver quoted by the ILC: “If the French state can respond positively to the managers of the gas stations, then it can and should respond positively to the 145 other demands of the strike.” Road blockades and demonstrations had closed service stations last December and obtained a reduction of 31 centimes per liter on petrol. While the strike has been solid and peacefully run – 40,000 attended a Jan. 25 carnival to support the strike – the French government has sent extra riot police from the CRS (French National Police, or Compagnies Républicaines de Sécurité) to intervene wherever and whenever it sees fit. Memories are still fresh in Guadeloupe of the 100 people shot to death by the CRS during a demonstration in 1967. In this tense situation, Domata issued an open letter to French trade unions and “left” political parties, calling for international solidarity. This call has fallen on deaf ears. While issuing vague messages of “solidarity” in press statements, none of these parties or trade union leaders has called for strikes, sympathetic actions or protests of any kind. Such empty remarks are a cover for the silence of the trade leaders; no demands have been made for urgent action to come to the aid of Guadeloupean strikers. In the name of unity, Krivine has no public comment to make which might embarrass his party’s relations with the trade union bureaucracy. In the same edition of Rouge, an interview appears with Patrice Gonot, the leader of the Cercasol party, the LCR’s new NPA party’s sister organization in Guadeloupe. He is also active in the CTU union (United Workers Centre). After citing the strikers’ demands, Gonot states: “There have been united meetings in all the towns. All our resentments are put to one side, because it is the future of Guadeloupe which is at stake.” The working class and its political independence is relegated to the future of “Guadeloupe,” which includes the propertied classes. The Socialist Party’s national bureau issued a press statement which completely distorts the strike’s aims. It expresses no support for the strike, but arrogantly asserts the demands to be its own. It claims its document proposing to stimulate the French economy by helping business and banks, as well as proposals for insignificant minimum wage increases, have been adopted by the strikers. The PS (French Socialist Party) holds the presidency of the devolved Guadeloupe regional council, which bears part of the responsibility for the current degradation of workers’ living standards, inflicting as it does at every turn the politics of the Sarkozy government on the French population generally. The SP controls 22 of France’s 24 regional councils. The “left” establishment, whether in Guadeloupe or metropolitan France, is duping workers and handing the initiative to Sarkozy’s right-wing government to foist the consequences of the economic crisis onto the backs of the working class. In order to satisfy all of the Guadeloupean workers’ legitimate demands, the unity of the working class must be forged on the basis of socialist internationalism. The current bourgeois regimes should be replaced with workers’ governments, which would reorganize the economy under the democratic control of the working class for the satisfaction of social needs of the vast majority. In its solidarity statement, the CUT trade union federation of Brazil wrote on Jan. 29: “The Central Confederation of Workers (CUT) of Brazil is in total solidarity with the general strike of our fellow workers in Guadeloupe and we call on the French government to immediately come back to the negotiating table with the organizations representing the workers and meet the demands put forward by the general strike.” The statement is signed by Julio Turra, a member of the CUT Executive Committee. The Malcolm X Grassroots Movement issued this solidarity statement on Friday, Feb. 13: “To our Sisters and Brothers in Guadeloupe and Martinique, You Are Not Alone! The Malcolm X Grassroots Movement (MXGM) denounces in the strongest terms the threatening posture of the French government to the peoples of Guadeloupe and Martinique. We will not sit idly by and let the French government continue to treat our brothers and sisters as colonial subjects, or worse. 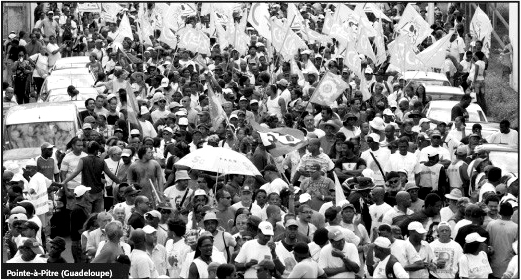 We stand in full support of the just demands of the people’s movements of Guadeloupe and Martinique for economic, social and cultural rights, human dignity and self-determination. “MXGM serves notice to the French government that the resolution to the crisis in Guadeloupe and Martinique can only be addressed through diplomatic means in full accord with international law. Any invasion or use of force to crush these political conflicts would constitute a clear human rights violation. This crisis will only be justly resolved when the French government fully complies with all 146 of the people’s demands. Nothing less will be satisfactory. French riot police landed in Martinique and strike leaders in Guadeloupe suspended negotiations with France on Thursday, Feb. 12, the Associated Press reported. The Martinique police chief “said 10 people have been detained for looting and stealing gasoline. Garbage (is) piled up in the streets, and supermarkets were closed for the eighth straight day,” according to the AP. “On behalf of the international working class solidarity, on behalf of democracy, we again call for your support. This story first appeared on the World Socialist Web Site. Bay View staff, MXGM and ILC contributed to the story. It makes me so happy to see the bay representing on this issue! I am a San Francisco native, studying French, Spanish and Latin American Studies at London Metropolitan University (London, UK) in Martinique now for my year abroad. The protests in Fort de France have been the most peaceful I’ve seen despite the the images which have been broadcast around the world. Matink sé ta nou! Matinik sé pa ta yo! Martinique is ours, not there’s. Thanks for your support! Every people in the world has to know that the only answer of state colonial french and the big boss is making police brutality. Are they sure that France is a democratic country? Are they sure that France respect the human rights? This is awesome! im glad the people of Martinique are fighting back.